Learn how to make yellow tip bubbles go away in Paperless Pipeline. Yellow tool tip bubbles (like the one below) keep being displayed even after you have clicked the "OK, got it" button. Make sure that you are clicking directly on the "OK, Got it" button on each yellow popup tool tip. That tells Pipeline that you have seen that particular tip. It will then not show that tip again. Clear your browser cache by holding down the Command and Shift keys on your keyboard then tapping the 5 key (command-shift-5). Clear your browser cache by holding down the Ctrl key on your keyboard then tapping the F5 key (Ctrl+F5). Click the settings bars in the upper right corner of Firefox Click Privacy. In the History section, make sure "Use Custom Settings for History" is selected. 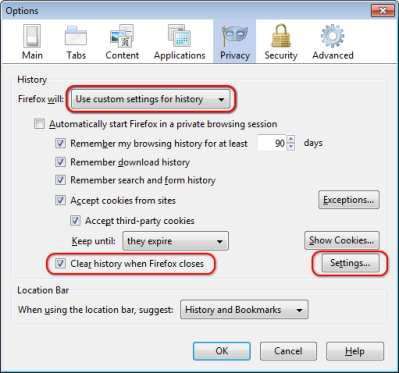 If you don't have that Firefox will "Use Custom Settings for History" like shown below, then disregard this step. Make sure the "Clear History When Firefox Closes" checkbox is not checked. If you've completed these steps and the yellow bubbles still won't go away, please email help@paperlesspipeline.com for further assistance.